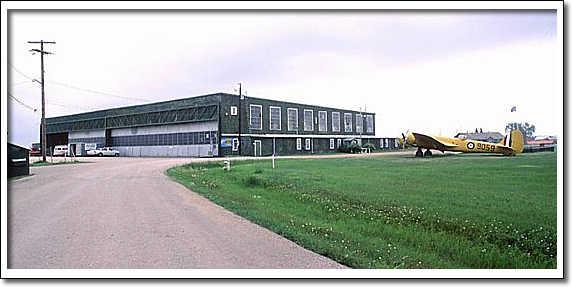 The Commonwealth Air Training Plan Hangar, built in 1941, recalls Canada's important contribution to the Allied war effort during World War II, through its associations with the Commonwealth Air Training Plan. On December 17, 1939, the "Agreement Relating to the Training of Pilots and Aircraft Crews in Canada and their Subsequent Service" was signed among Canada, Great Britain, Australia, and New Zealand, making Canada the focus of a British Commonwealth-wide plan to instruct Commonwealth aircrew. It was a major Canadian contribution to the Allied war effort and to Allied air superiority in World War II, and an impressive national achievement. At the Plan's peak, there were 107 schools and 184 ancillary units at 231 sites in nine provinces. The aircraft establishment stood at 10,906 and the ground organization at 104,113 men and women. The Plan lasted until March 31, 1945, and was called the "Aerodrome of Democracy" by President Franklin Delano Roosevelt of the United States. The former Brandon Hangar #1 is especially important, not only because it is virtually intact, but because it now functions as a museum devoted to preserving the history and artifacts of the Plan, including several vintage training aircraft.